How much Delta V does your rocket have? Enter your engine's specific impulse(ISP), your rocket's starting mass including fuel, and your rocket's mass after burning the fuel. This will show you your rockets estimated Delta V for the amount of fuel burned. 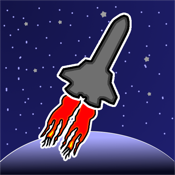 Delta V Calculator is a great tool for games like Kerbal Space Program. Warning - Not to be used with real rockets! !